I was really taken aback by the reaction to the first post I sent out tentatively on Thursday night from the kitchen table. Thank you so much to everyone who took a peak, shared and commented. Cooking is the most fantastic creative outlet for me. Kneading bread is very therapeutic and icing is plain good fun. Time in the kitchen really does have the power to make me feel good. Early on I discovered The Hairy Bikers’ Big Book of Baking in my local library. I had the book for so many weeks, renewing – and failing to remember to renew it – I finally took it back when I realised popping out to buy butter twice a week as I worked my way through the European recipes wasn’t sustainable long term. 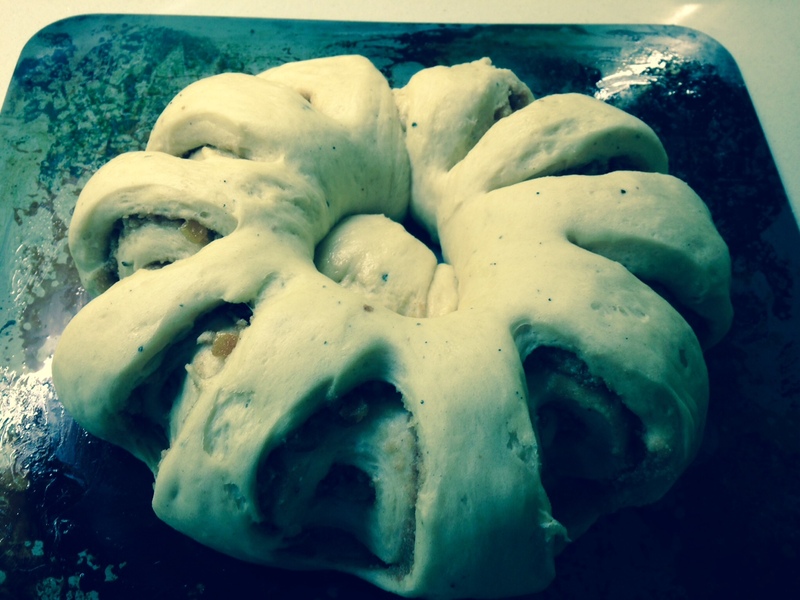 Our favourite recipes (so far) are their Scandinavian Tea Ring (160g butter) which tasted divine – photograph below before it went in the oven – and Romanian sweet bread (just 100g butter – my standard loaf only needs 20g butter so that puts the measure into perspective). There is a reason why Si King and Dave Myers went on to produce diet books. I find making something new intensely satisfying, and if I get any compliments from the team at home then up soars my morale. Now that you have time on your hands, can you spend some of it doing things you enjoy and know you’re good at? Would it help you get recognition from your friends and family? Redundancy made me feel lonely, guilty, resentful, envious, angry and very sad. It made me cry a lot. The feelings of rejection were overwhelming. 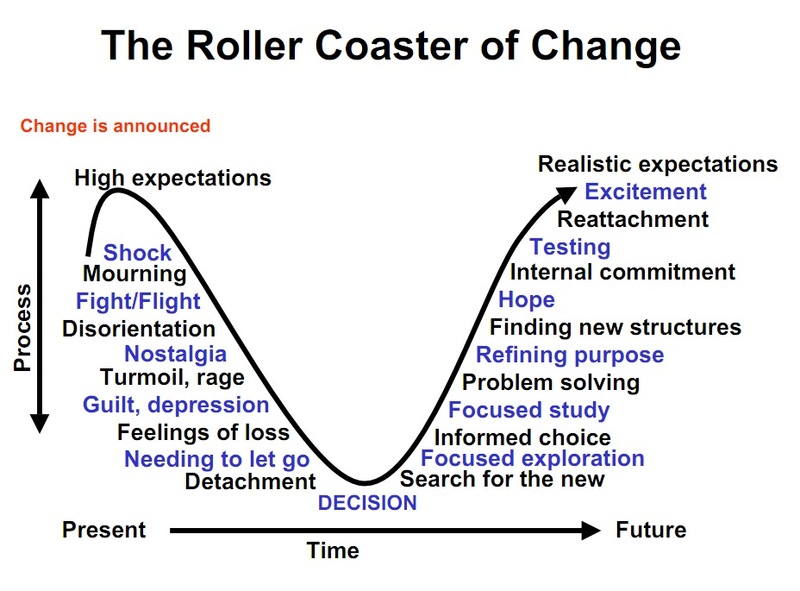 People pointed me in the direction of Elisabeth Kübler-Ross’s stages of change, which shows what a rollercoaster it can be like and how it’s likened to bereavement. I had to smile and grit my teeth when what seemed like scores of people said it was the best thing that ever happened to them. When you’re in the throes of it all it might feel absolutely awful. A lot of people have helped me through. I bought a Moleskin book and asked colleagues to write a comment about something I’d done or said in the past that I could look at when I wasn’t on top form. It sounds naff I know but it really worked, and I’m so grateful that people took the time to do it. The darker days have passed for me and I’m enjoying looking forward to the future. Remember what I loved about my job. I kept a notebook on me and wrote a lot of things down after I left about the things I really enjoyed, and tried to work out from this what I might look for in a future role. Being a member of a team was a big part of my life, I was fortunate to lead a department and sit on the senior management team of the division. I realise increasingly that I flourish when I’ve people around me, to feed off, share snippets of excitement and good news with and I hope guide, inspire and energise. So both working for myself and on my own isn’t an option, I need to find a shared space and surround myself with creative people.